We knew that the day would come on which Mozilla would remove all classic extensions, Mozilla calls them legacy, from the organization's AMO website. Legacy extensions are not compatible with recent versions of the Firefox web browser. The website returns "page not found" errors for any legacy extension that you might still have a link for; search has been updated already to return only those extensions compatible with recent versions of the Firefox web browser. 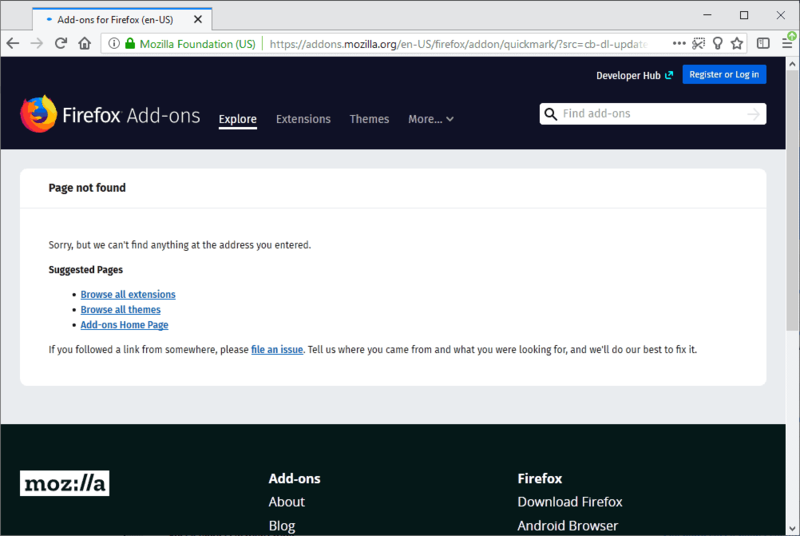 Mozilla switched to a new extensions system in Firefox 57 which it released to the stable channel in 2017; only new extensions, called WebExtensions, are supported in recent versions of Firefox. Firefox ESR, the Extended Support Release, was the last version of the Firefox web browser that supported legacy extensions. The Firefox 62 updates, released in September 2018, moved Firefox ESR installations from the legacy extension supporting 52.x version to the WebExtensions exclusive 60.x version. Mozilla planned to remove legacy extensions in October initially but October passed without action. Mozilla wanted to remove legacy add-ons from the frontend Store only so that they would not appear in Search or listings anymore. The extensions would still be available in the backend so that developers could update the listings and publish new (WebExtensions) versions of extensions that were removed from Mozilla AMO. No version of Firefox that is officially supported supports legacy extensions anymore. Browsers based on Firefox code, e.g. Pale Moon or Waterfox, support legacy extensions and will continue to do so at least for the foreseeable future. Those users may use project-specific extension repositories, if they exist, or an add-on like Classic Add-ons Archive. It makes sense from a usability point of view to hide or remove extensions that Firefox users can't install anymore in any supported version of the browser. It is still a sad day to see that many extensions, many excellent, removed from the Internet. While you may be able to use the Wayback Machine, the classic Add-ons archive, and other preservation services to look them up, it would have been a nice gesture if Mozilla would have created a read-only archive of legacy extensions on its site that would be separate from the actual extensions Store. I have to comb through all Firefox extension reviews of the past 15 years or so to remove any link or even the review from this site. Our list of the best Firefox extensions will shrink to a third of its current size once I'm done with it. Now You: What is your take on the removal? The end of an era. Luckily, the new, communitary forces leading XUL have got our back. The end of an era, indeed. I’ve referred to AMO’s “legacy add-ons” (when they were only “add-ons”) for so many years where they contributed to my fascination about Firefox customization that they being removed in favor of Webextensions only does stir a bit of emotion. It makes sense, nevertheless. Search engines are going to have to update those links, still available perhaps on most of them. Classic Add-ons Archive @GitHub fortunately keeps them accessible to whom may be concerned. I’ve managed like many of us to achieve practically all what these former legacy add-ons allowed; I was running at the time ~70 add-ons and now ~45 webextensions, I don’t feel frustrated. My concern is less webextensions vs. add-ons then Firefox’s core, more and more complex with too many features I consider as gadgets and a flow of settings which need to be modified for a best user privacy experience. But these settings are available which is the main point. There’s subjectivity as well as objectivity when it comes to defining a perfect browser. I get along with Firefox Quantum now and as long as it’ll make settings available I’ll continue to consider it is the best browser for little old me : no message to the people. Martin, I hope you don’t follow Mozilla’s tactics and purge that important part of your “best Firefox extensions” list! You could split it, and present it as a separate article for those browsers that can still use those excellent extensions. We all know that their “modern” counterparts Pale in comparison (pun intended). Their removal is no surprise, but it doesn’t mean they’re gone from the internet! ALl it means is that they’re gone from AMO. thats only a short term solution.downloading and “keeping safe and sound” is all right at this present time but as time marches on they will simply stop working. Only if the browser stops supporting them! In the long run, all software will stop working, though, so I’m not concerned about the long run. I’m concerned about the now, and for now this is fine. When it stops working, I’ll find another solution. People using legacy addons are using older version of Firefox so no update means they will keep on working forever. Same, I have made local backups of latest ESR52, x86 and x64, en/ru/ua localizations and tens of XUL extensions, some even multiple release versions. These days I use primarily Chromium on Windows and Android, but ESR52 is my secondary browser still, mainly due to extensions. The best browser is a browser with no extensions at all, because you are able to see and to taste the stability, speed and sustained performance of the browser with no extension interference. If one extension is good or it has big success for high number of users, it should be merged in some way to the browser itself to add some supervised functionality, technical browser support and also some improvement guarantees from the Mozilla Corporation (or even Chrome support team in the case of Google of course, it’s just the same situacion for both current major browsers). Furthermore, nobody can guarantee the proper functioning of one browser if the user can add dozens of extensions with no type of crossed testing nor crossed valuation of their possible combinations and their deep impact on their browsing speed, performance or privacy. Opera v12. Damn, that browser needed zero extensions to be the best at its time. Everything useful was already built it, all this while still being the lightest browser vs competition. Even after they sold it to a Chinese conglomerate, I’d still be using Opera 12 if some idiot hadn’t dumped the source code to github. I also didn’t use any extensions with Opera 12. Opera 12 was the best browser ever … nothing created in the future will ever hold a candle to it. Seems to me it depends of the webextension. Firefox out of the box without ‘uBlock Origin’ is definitely slower, heavier. My opinion is that browsers as well as OSs are nowadays not fit to suit users concerned by privacy before they get “cleaned”, even Firefox. Every browser without adblocking is slower because the browser has to load said resources for that site. I disagree. The best browser is one where the browser itself contains the least number of features possible, and features are added through extensions. This is because it allows everyone to have the browser be the way they prefer without having to take on the code and UI for the things that they have no use for. “One size fits all” means that it fits nobody well. I disagree with you John Fenderson. Security researchers don’t test extension when they test browser security. The whole reason the legacy add-on system was scrapped was due to the security nightmare it presented. Some features like ad blockers are a no-brainer, and should be incorporated in every browser. And don’t try to add the BS argument that adding features will slow down the browser. Opera 12 had every feature you could possibly want, AND it was fast, and ran well even on old hardware. I only move to Firefox when they eliminated the legacy (from Netscape Navigator) add-on system. Prevous to Firefox Quantum, Firefox’s add-on system was too insecure IMO. Opera 12 is gone (due to the idiot who dumped the source code on github), but that doesn’t mean the concept of a browser that doesn’t need extensions died with it. That isn’t the main reason that Mozilla states. Regardless, I don’t agree that security is a valid reason to remove the framework, unless there is another, safer, framework that can adequately replace it — and, with Firefox, there isn’t. The security situation is a valid reason for the browser to give big scary warnings about extensions and to use default settings that enforce maximum security for users who just don’t want to handle security themselves. However, in the end, it should be up to me to determine what risks I am or am not willing to take. That’s not for Mozilla, or any other browser manufacturer, to decide for me. I’m not sure why you bring this up — I’ve never made this argument. But, since you brought up security, I will bring up the fact that the more features a product has, the less secure it can be because every feature increases the attack surface. Exactly. This whole extensions mania went to ridiculous heights. As exemplified by people who boast having had 70 extensions on a single freaking piece of software. I can understand the fun side of it. It’s a hobby. Some people will have electric toy trains running all around their house. Some people prefer Linux to Windows not because it’s safer, but because it’s a nightmare to have it work. I completely get it. However, this is a tiny-weeny subset of users, and they shouldn’t be allowed to drive the Firefox project. A program loaded with 70 extensions cannot be a good program. Besides all the security, compatibility and update implications, what will inevitably be missing is coherence. Unicity of concept. Smoothness of workflow. A tidy and intuitive interface. I wouldn’t be as extremist as that and ban all extensions on principle. Other software eco-systems have extensions working out quite all right. Think Kee Pass, or Zotero. However, when the add-on part is getting bigger than the core program on your computer, you’ve got a problem on your hands. Extensions are good for two things : the occasional, specialised feature whose appeal is not broad enough to warrant work time by the main developer (templates, mission-specific applications…) ; and the one-off stroke of genius which is so good, you couldn’t envision the main software without it. Browser-wise, I would put uMatrix and Dark Reader in the latter category. But not everybody is Raymond Hill. Take Kee Pass. It has a sizeable number of add-ons. I use a single one, which adds automatic backup. This feature should be baked in the main software. It has been inexplicably overlooked by the developer. The add-on is clunky and primitive, but there’s no alternative (except other add-ons). There are other add-ons increasing Kee Pass integration with browsers. Although they make the program easier to use (supposedly), they lessen security. They shouldn’t be used if you’re serious about security. That’s something only the main developer should mess with. I know I can trust Mr. Kee Pass developer, but what about Mr. Add-on developer, who’s on the other side of the world, does not collaborate with Mr. Kee Pass, and might have precious little time to devote to his add-on ? There are currently around 15,000 extensions in the store. How many legacy extensions were removed? The classic add-on archive by JustOff contains 16706 add-ons, that’s a subset of what was deleted from AMO. I’m not sure what your point is here. While I have no doubt that there are far more legacy extensions than new ones, how many of each there are isn’t terribly important. What’s important is what functionality they make available. Basically the really last thing what separated Firefox from it’s competition is gone by now. Really quite a lot of what Mozilla can by now be proud of themselves. Settings are increasingly under the hood in Firefox when they’re statically absent in Chrome’s flags. I often read developers, engineers digging into the latest possible browser improvements regarding mainly networks’ evolution and their works take Firefox as the ground, stating Chrome as unsuited or requiring more work : Chrome is basically closed to settings which really, deeply involve users’ privacy given it’s in contradiction with an ad company and its tracking anthology. I still don’t understand Chroe’s success unless to consider that users are abandoning privacy as a value parameter when choosing a browser. Also, a lot of sheep attitude. I think it’s quite easy to explain when you look at what’s important for average people: Saving time and having a good experience. Chrome offers the perfect integration between all the hardware people use nowadays, and most people use Android/Google anyway. There is no alternative to Google when it comes to workflow, except maybe Apple but it’s too costly for most people. The younger generation is growing up with Android and Google, for them Desktop browsing is increasingly supplementary. It’s natural they chose Chrome for such things as well, because everything is integrated. Firefox doesn’t offer much for those people, that’s why it has lost the mobile market, and is not getting any new users on Desktop. It looks like everyone who is using Firefox today already used it 2-3 years ago, where Firefox peaked. Casual Apple users can resort to Safari, casual Windows users to Edge, and those who are more tech-savvy chose Chrome. The thing is, desktop is losing relevance very quickly. In the future the browser will be baked into the OS just like Webkit is on iOS. We need Firefox to remain a true browser of the old free web that doesn’t care about the pressure of Google and Apple, but Mozilla doesn’t want to accept this responsibility, because that would mean drastically downsizing the operation, working together with the community, relying more on donations, and losing lots of revenue. I acknowledge. Time flies and seems I’m off-track when it comes to the realities of the younger generations and the markets accordingly. I understand better this other perspective you describe and Chrome indeed seems to fit better tan others perhaps. Need to say that together with the reasons you detail there is a loss of concern for privacy amid these younger generations, or at least among many of their components. I don’t want to shift again on societal considerations but I imagine loss of privacy requirement is the loss of one value among many others. Many don’t feel ashamed of using cheat sheets for winning games and don’t give a damn about their privacy, they swallow the world as it comes in the near-to mentality of what seems to be “do it to them before they do it to you”, as if life was not a challenge but a clash conflict. I’m getting off-track, now aged 65, as if i observed a new world emerging. The primary reason people use Chrome over Firefox is because you can right-click an image & do a Google image search in Chrome out-of-the-box. I have no idea if there’s some web extension in Firefox that does the same thing, but people can’t be arsed to search for a web extension in Firefox, when it’s part of Chrome’s default behavior. And as far as the younger generation (that you mentioned), you don’t think they see an image of a “hotty” on-line and not want to reverse image search (Google Image Search) that image to find the Instagram/Snapchat for that person? If Firefox added a right-click menu item to Google Image Search (or created an equivalent to Google Image Search that was as good as Google Image Search), and advertised that they created a right-click to Google Image Search on-line, many people would switch to Firefox, because Firefox offers better privacy. That sounds like a rather dubious proposition. I have no problem believing that this is critical for some people, but the idea that it’s the primary driver for the majority doesn’t sound plausible. I’m willing to bet that the majority of web users never or only rarely do image searches at all. @John Fenderson, I disagree w/ you. It’s hard to find any stats on the volume of Google Search, but here’s a link to an article in Techcrunch titled “Google Image Search: Over 10 Billion Images, 1 Billion Pageviews A Day”. ONE BILLION PAGEVIEWS A DAY, and that was 8 years ago. You said that “the majority of web users never or only rarely do image searches at all” without any sources to backup your claim. Point of fact, people are making a BILLION image searches per DAY. Obviously, alot of reverse image searches are part of that billion image searches (photographers, ad agencies, etc. use reverse image search at their job, on top of ordinary people who use reverse image search to find people’s Instagram/Snapchat account). True, I was speculating — just as you were. Neither of us are supporting our claims (I don’t think it’s possible to, either way, without access to Google internal data). It still doesn’t seem plausible to me that image-based searches are a major factor driving the use of Chrome. I would be surprised if this were true. Chrome doesn’t offer much for the tech-savvy, I think. Its target audience appears to be more of the “don’t know or care much about tech” crowd. It appears to me that this is related to the change in direction that Mozilla decided to take Firefox in: they’re clearly following the Chrome model of becoming a dumbed-down browser for the non-techy masses. That may or may not be a good decision for Firefox, but it’s certainly a terrible decision for me! That will be a dark day for sure. Wasn’t that what Microsoft tried to do with Windows 98 and Internet Explorer 4? in 1998? Yes, and they succeeded. It’s still integrated to this day. I speak about features which are creativity wise above what the competition offers. For Firefox this was customization and add-ons which have been beating all what the competition had to offer. All that is gone now. Security/privacy features belong to usability – but are far away from what can be called creative/unique. @Lord-Lestat, it doesn’t seem to me that Firefox customization and ad-hoc add-ons is a vanished scheme. It’s different. It does require more time and efforts to tweak one’s Firefox than before Quantum but it’s possible. Wide opened doors of the past are not shut but not all locked which obliges a user eager to customize “his” Firefox to search and think harder then before (which is always good by the way, makes one’s brains work harder!). I’m not a techie, but organization together with my preferences of aesthetics brings me to tweak Firefox Quantum quite deeply, besides the privacy settings, and i promise that I get out of this Firefox “of mine” more than one could expect. But that’s hours of searching, testing, comparing. Out of the box Firefox is no longer as easily “customizable” as before Quantum, with that I totally agree. Sadly you are unable to do most customization like you have been able before, even when you dig deep into Quantum – forget it. Most creative customization options are NO longer possible and will no longer be possible as they are running against the concept of a “simple and fast and minimalist” browsing experience – which is all what Mozilla cares for today. Fact is, what Firefox has become is a shallow copy of a once glorious web-browser. And no matter what Quantum does, it will never ever regain it’s former glorious greatness. Now, using Firefox is equal with using Chrome, or Opera or Edge – it just makes no difference anymore, as Firefox has stopped being a creative software. It is now just more of the same – with the benefit of some privacy/security additions. And once the option to customize with CSS is removed – which will be upcoming sooner or later, as Chrome too has no userchrome.css – Mozilla’s shameful transition into just another generic browser has been finished. Nothing interesting to see here anymore sadly. And until it goes one more steps downhill is just a matter of time, as Mozilla is far from done with “streamlining and making Firefox simpler”. That alone is a statement which should scare anyone. Well, Pale Moon is a thing. Legacy items had too much power over the browser that they could write to disk. Oh it does not. Its just another way for them to give the finger to those people that didn’t jump on their ‘upgrade’ as the next coming. Just as easy to have taken the intervening time to show the incompatible addons as such, and have the newer browsers only automatically pull down pages related to compatible versions. Going forward if the old ones were truly unpopular they wouldn’t be using any bandwidth. They would sit there taking up static storage who’s cost goes to zero over time. Now even if I could find the equivalent in their new ecosystem I have new inspiration not to, and reason to continue support for those projects like Palemoon that are listening to their users. Firefox 52.9.x will be the last browser i use (i will never reach the Quantom age). I fake the user agent on and off on some sites, but it works quite well. Security is more and more put on to computer level, f.ex via the HOSTS (at the moment 86 000+ blocks), but i also keep security/privacy related addons. Try Basilisk, the UI/frontend is the same as ESR52 but UXP, the platform/backend, is a further developed ESR52. It is leaner, faster and more secure. 100 000+ blocks via the HOSTS here. Reached the Quantum age, with the working-quite-well user agent spoofing, who also keeps tons of security/privacy related addons. You make me feel sorry for your resolutely final decision. Take care. is there a way to save / backup Firefox addons ? I use ublock, flash downloader, page screensoot, block coin miner and a few others that are very important to me. I have been loyal to Firefox from the beginning but they end up with this ????? One could make the same argument for past, now-unsupported releases of Firefox, yet Mozilla maintains an archive of all Firefox versions at https://ftp.mozilla.org/pub/firefox/releases/. So I can download and run an older version, but I can’t download and install the extensions for it. Why? If you do this, you will deprive your readers of a valuable source of information about those extensions! Since when has the Internet been only about what is current? Ty Mozilla..and NOT. Moved back to 56.0.2 due to massive Trouble with the NEW Version. Just wanted to get my favourite Fulltheme Ft Deep Dark back again, what do i have to see? Mozilla removed all,…and so on, as i think it’s a hit in the u know what. Nononono, they wanna loose all their Users? Don’t get it. Okay, with 56.0.2 i get back the fine Developer Themes in Light and Blueishdark, that’s okay for me. 95% of my Addons also work, so i’ll stay with it and disabled Updates. Alls fine again, no Trouble so far. Have fun with all the unpatched security issues it has, I’ll be safe and sound using Waterfox 56.2.5 with all the security releases backported. @Anonymous: when it does, I’ll just stay on the older version of Waterfox until I can find a browser that better meets my needs. No problem. Any OS worth using won’t prevent installing alternative programs. Win10 hasn’t gotten to that point yet, even though they are pushing their online apps on the less savvy. I don’t even allow updates. Yep, Mozilla is a dead lizard to me; no interest at all in what they do now. For me it’s Vivaldi along with Pale Moon 26.5 for certain sites, so losing the old extensions does hurt. Please don’t erase them without a trace, Martin. You can see that many of us just aren’t ready to let them go. Jozsef, glad there are some die-hard Palemoon users….and 26.5 is the best of the older ones and one that i use also. actually i use the portable 26.5 on a flash drive and sandboxed and just love it. between that and Opera i can do anything. good luck! Why stick with such old version? Is there anyway can we get those removed add-ons back. I’m using old version for some reasons. So I need those old firefox extensions can anyone help mee.. Newer isn’t always better and this is a perfect example! There was nothing ‘wrong’ with v56, they ‘broke’ something that didn’t need fixing! Too many post teenagers with their ‘toy cell phones’ and their ‘lazy’ way of doing things. I doubt most would/could even use a real computer! How do I feel about it? If I could kill them all, I would. I use XP. The Firefox I use uses legacy/classic addons. I am PISSED OFF beyond measure that I now no longer have a place to get them.